The story of San Francisco's early jitneys is a lot more complicated, and interesting, than the Free-Market fables that are being told about them. 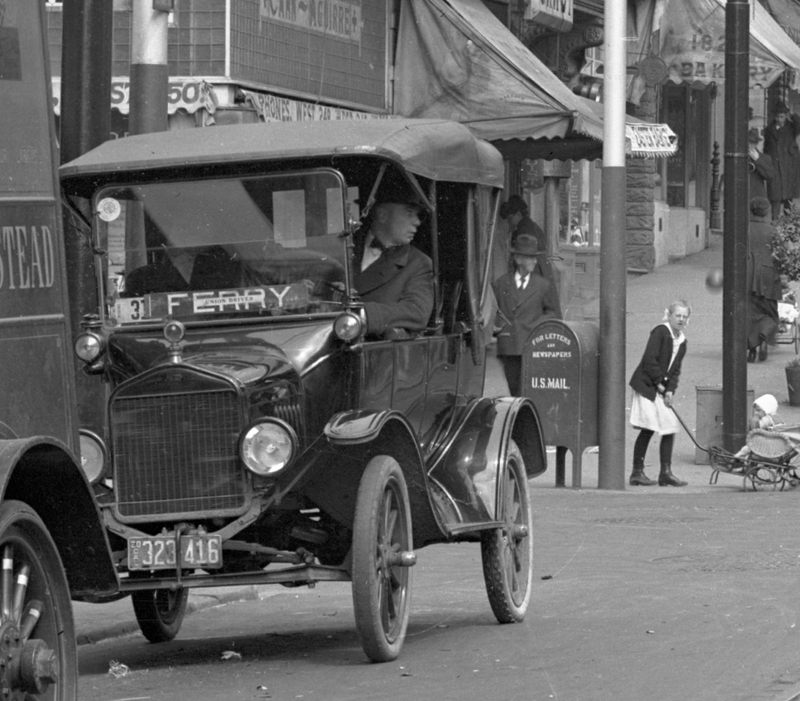 On Fillmore at Sutter in 1920, a jitney driver waits for passengers to cross the street. As I wrote last week, San Francisco’s famous jitney tradition may have just come to an end after a little over 100 years. The timing is ironic: jitneys are being claimed as inspiration by a whole host of new “disruptive” app-enabled transportation companies. Uber CEO Travis Kalanick even proclaimed his own company as the modern equivalent of the jitneys, which he believes were “regulated completely out of existence” by over-regulation soon after they started. The message: don’t regulate Uber! Jitneys helped promote the automobilization of city streets. The numbers of early jitneys were unsustainable. Jitneys survived because their drivers unionized. In an important sense, Uber is more like the old streetcar monopoly, than like the jitney. We can get a glimpse of this history in some beautiful photographs of early San Francisco jitneys from the SFMTA Photo Archive. One of the most fascinating things about most of the photos in the MTA's archive is how utterly boring their intended subject matter would be to anyone but the wonkiest transport historian. In most images, the focus is on streetcar tracks before, during, or after repair work. 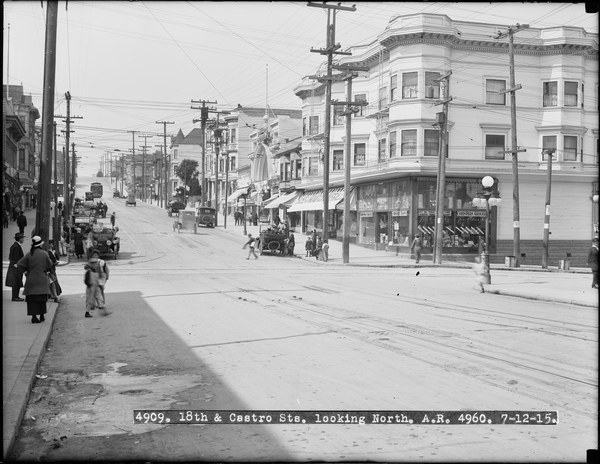 Jitneys at 18th and Castro, July 1915. Detail of photo U04909 at SFMTA archive. “Jitneys,” named after the slang term for a nickel, got their start in late 1914 in Los Angeles, where down-on-their-luck auto owners first got the idea of driving along street car routes, giving rides for the same 5-cent price as the streetcar. The idea caught on quickly due to a rise in unemployment that came with the beginning of World War One. 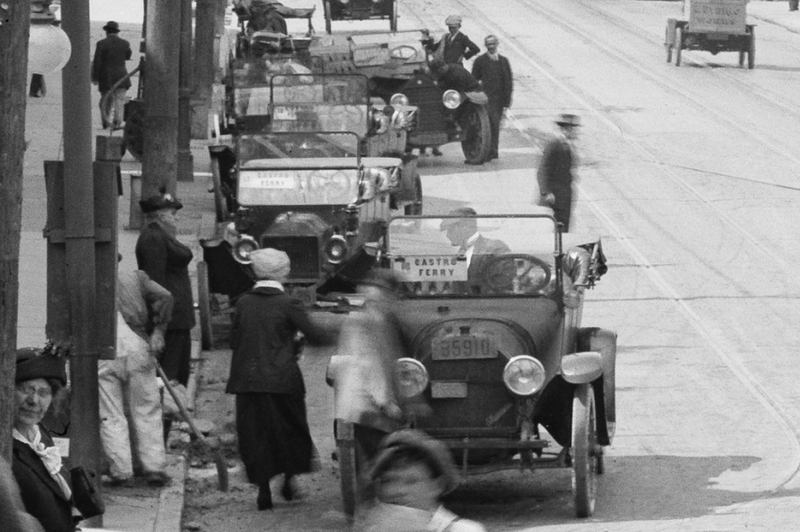 Automobile ownership had been expanding rapidly in the previous years, and among the ranks of the first jitney drivers were many recent auto buyers who, having lost their jobs, had to find a way to put their “Can’t af-Fords” to work. Jitneys were on the streets of San Francisco by December 1914, and the idea spread like wildfire through the cities of the West. 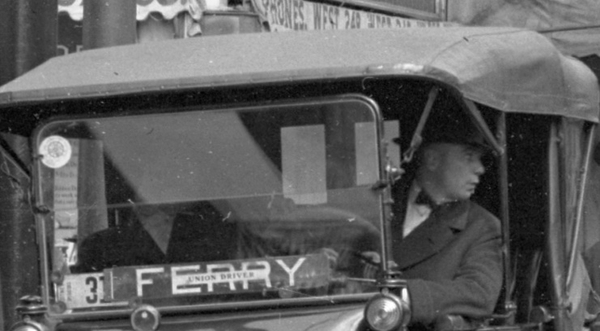 The earliest jitney drivers simply put signboards in their windshields indicating a route (in the above photo, “Castro — Ferry”). They followed this route picking up and dropping off passengers along the way. Unlike the streetcar, stuck on its rails, jitney drivers could make detours, go off route to take passengers to their doors, or turn around and reverse direction at will to maximize business. Just like empty taxicabs do today, they mostly followed established streetcar lines, trying to entice waiting passengers. This antagonized the streetcar companies, which complained that they were losing money because jitneys were poaching their riders. Valencia-Street jitney at Front and Market, 1915. Detail of photo U04980 at SFMTA archive. 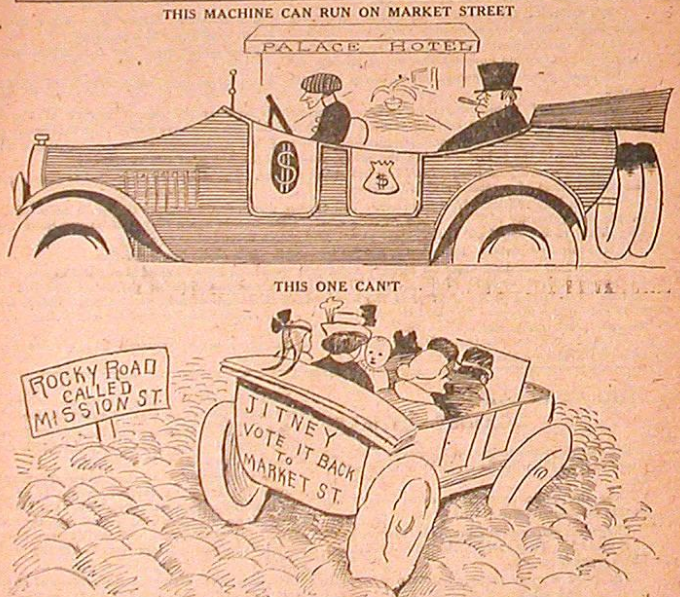 The conflict with streetcars was not the only controversy that assailed the early jitney. As viewers of the famous 1906 film shot from a Market Street cable car can attest, urban street traffic was very different before the ascendancy of the automobile (and even in the 1906 film the number of automobiles is exaggerated by the fact that the same half-dozen or so keep circling the camera). Pedestrians—like this Sam Spade-looking character stepping out across Market in front of a jitney in 1915—shared the streets with vehicles on a much more equal basis than today. To such urban walkers, jitneys could be a menace. Though autos had been on the city streets for over a decade, jitneys brought them out in force, travelling en masse down crowded streets. Jitneys were blamed for a wave of collisions with pedestrians and other vehicles, as a natural consequence of the rising numbers of automobiles on the streets, with a lot of inexperienced, amateur drivers at the wheel. 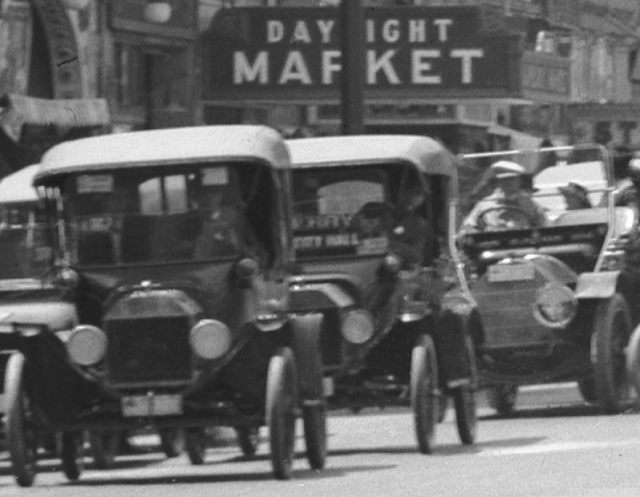 (A few seconds of footage of jitneys driving on Market in 1915 can be seen in the film "Mabel and Fatty Viewing the World's Fair at San Francisco," starting at 5:21). 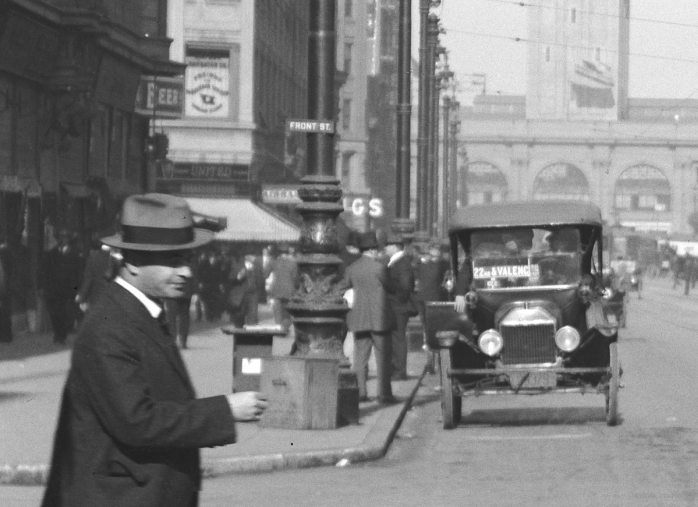 Jitneys in traffic at 6th and Market, 1916. Detail of photo U05299 at SFMTA archive. Jitneys were just as popular with riders, however, as they were dangerous for pedestrians. For the same price as a streetcar, you could get a much faster and more comfortable ride. For many riders, this was their first experience riding in an automobile, which had formerly been a privilege of the rich. Jitneys were said to spread the automobile bug—after all, anyone could join the ranks of auto owners by buying a used car and driving it as a jitney! "Not A Jitney" placards. From Popular Mechanics, June 1915. San Francisco has become so thoroughly infested with “jitney busses” that drivers of private cars are continually having to explain to would-be passengers that their machines are not for hire. Hundreds of these cars competing with the traction lines are plying the streets of the city. 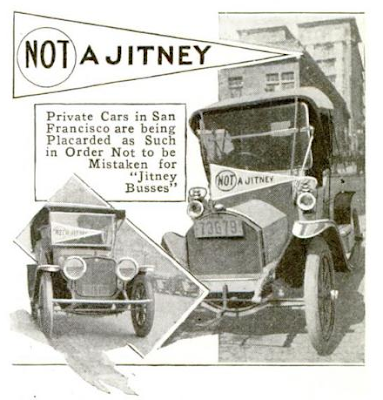 Several motor-car owners, tiring of being frequently mistaken for “jitney” drivers, have labeled their machines with signs reading, “NOT a Jitney,” the “not” being emphasized by an encircling ring. This placard is placed on the windshield, or in some other position where it is plainly visible to the jitney-hunting public. (Popular Mechanics Magazine, 23:6, June 1915, p. 839). The numbers of early jitneys were unsustainable. Wave after wave of drivers swarmed onto the streets with dreams of making money with jitneys, only to be driven out of business by the oversupply of drivers and the unexpected costs of driving a personal vehicle as a bus. This is eerily similar to Uber’s labor situation today (though it is doubtful that early jitney drivers ever commuted from Stockton or slept in the Safeway parking lot). For a while, each new wave of jitney drivers going out of business was replaced by new drivers jumping into the game, but this couldn’t continue forever. Economic pressures led drivers to defer maintenance, and to speed and compete in the quest for passengers. These in turn led to a decline in the reputation of the jitney. This might already be implied in Charlie Chaplin's 1915 film A Jitney Elopement, filmed in San Francisco. The little two-seater Chaplin drives in the film would have been no use as a jitney, but it does need to be kick-started a few times, and tears through the city in a high-speed chase. 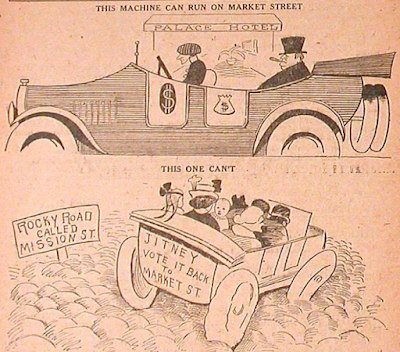 Cartoon protesting the limitation of jitneys to Mission Street. Jitney Weekly, September 9, 1916. Jitneys survived because their drivers unionized. To save their industry, jitney drivers formed associations and unions. 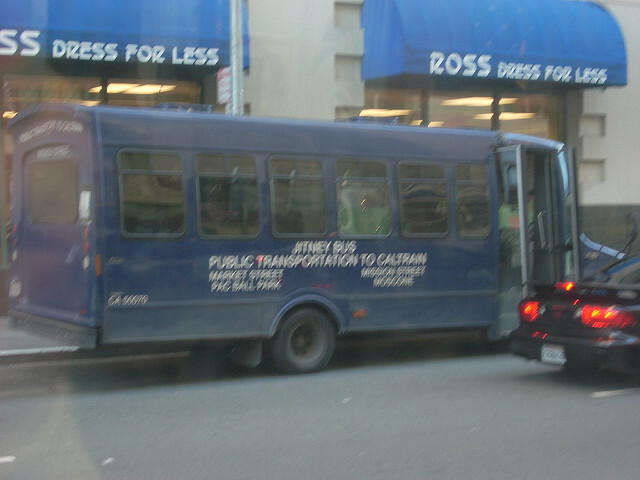 In San Francisco, the Jitney Bus Operators’ Union affiliated with the Teamsters and sought to improve the jitney industry’s reputation and viability by promoting moderate regulations (insurance requirements, and limits on numbers of drivers) that would stabilize the industry and head off attempts to quash jitneys altogether. San Francisco was a stronghold of the labor movement, and unionizing was an obvious step for San Francisco’s jitney drivers. Being unionized was seen as a necessary sign of working-class respectability. Blue-collar jitney riders would have largely been union members and supporters, and many people made a point of not patronizing anti-union establishments. One of the reasons San Franciscans preferred jitneys to streetcars in the first place was because so many of them hated—absolutely hated—the United Railroads, which was the dominant streetcar company before the growth of Muni. The URR had a long history of bloody confrontations with workers, and had faced down a series of very public, and popularly supported, strikes. As the URR was also the jitney drivers’ strongest political opponent, unionizing was a good way for jitney drivers to gain public support and good will. Which leads to a significant point of contrast between TNCs and jitneys: in an important sense, Uber is more like the old streetcar monopoly, than like the jitney. Whereas jitney drivers were self-organized, Uber operates through a top-down centralized network controlling information, pricing, and access. The jitney expansion was unplanned; Uber hired teams of lawyers before a single car ever hit the street. Jitneys were peer-to-peer; Uber only pretends to be. Uber has also taken an openly anti-union stance, much like the URR of yore, and has even gone so far as to invest money in the development of driverless cars, in the hope of doing away with drivers altogether. Could Uber drivers put together an actual peer-to-peer network that could challenge Uber on its own turf—much like the jitney drivers challenged the URR? Unfortunately, any such attempt would face massive difficulties simply because of the size of the incumbent, Uber. While the URR’s monopoly was based on the physical control of streetcar tracks, Uber’s is based on the network effect: smaller networks just can’t compete. And like the URR, Uber is willing and able to spend a lot of money trying to drive competitors out of business, and to stop unionization. Though the mechanisms by which the URR and Uber achieved monopoly are different, the effect of de facto spatial control is substantially the same. Jitney 97 in 2008. Creative Commons photo by Chris (Flickr). As documented by the late automotive historian (and San Francisco taxi driver) Mike Sealey, San Francisco’s jitneys got bigger over the years, following a pattern seen in other cities as well (such as with Mexico City’s peseros). Long-wheelbase limousines were used for many years, followed by vans. Jesus Losa, the city’s last jitney driver, drove 23- and 25-passenger buses on his route between 4th and Market and Caltrain. It is no accident that jitneys tend, over time, to look more and more like buses: though there was no love lost between the streetcar and the jitney, modern motorized bus systems carry the dna of both. San Francisco’s jitney industry entered a terminal decline in the 1970s, and all but expired in the 1980s. Several culprits can be blamed: competition from BART; insurance expenses; and new laws forbidding the transferal of permits. Another contributing factor seems to have been disorganization and hostility among the city’s jitney drivers, which prevented them from uniting to protect their industry. Until January 20, 2016, Jitney 97, piloted by Jesus Losa, carried on the tradition alone. Uber, far from picking up the torch, may have helped drive the last real jitney out of business. Thanks to Jesus Losa for sharing his story. Thanks also to Katherine Guyon and others at the SFMTA photo archive for enthusiastic help and great work. The archive is a great resource and everyone interested in San Francisco history should check it out at sfmta.photoshelter.com.